Symptoms of nutrient deficiencies in apple trees are visible to the human eye, but often overlap with other types of problems. Identify particular symptoms that are associated with specific deficiencies when determining the underlying cause of apple tree problems. Catching nutrient problems early will prevent the loss of fruit crops and severe tree decline. When apples are lacking sufficient boron, the apple fruits display cork formations during which plant tissue dries out and withering occurs. Additionally, the skin of the apple may simply crack. Young fruit that has not yet matured will experience stunted growth. Symptoms on the rest of the tree include dieback and death of branches, malformed bark and leaves, withering of flowers and the presence of rosettes, according to Pacific Northwest Extension. Among fruit trees, apples trees are the only fruit affected by magnesium deficiencies. 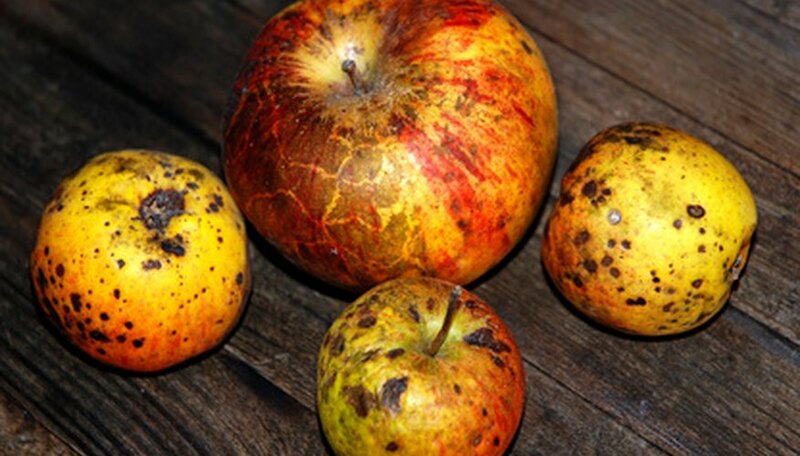 This nutrient problem includes many different symptoms and depends upon the variety of apple. Delicious apple varieties are less susceptible to magnesium deficiency than Newtown, Winesap and Golden Delicious. Symptoms include early partial to complete defoliation, stunted fruit growth, yellowing along plant tissue of leaf veins or borders that often dies and becomes a brown color, according to Pacific Northwest Extension. Apple trees suffer can also from copper deficiency. This nutrient problem, referred to as wither tip, causes foliage problems. During the middle of June, shoots that appear to otherwise be healthy and steadily growing display leaves that yellow, die and drop. The majority of the tree ends up exhibiting twigs with dead tips or withered tips, according to Pacific Northwest Extension. Zinc deficiency occurs on many orchard fruit trees including apples. Symptoms include the formation of rosettes, partial to full leaf yellowing, stunted leaf growth and decreased spacing between shoot leaves, according to Pacific Northwest Extension. Extreme leaf deformation and color change most often occurs on fruit trees with severe zinc deficiencies.